Louis Finkle is not a well-known name but, perhaps he should be. The Californian skateboarder was the first person to file a patent for an electric skateboard in 1999. 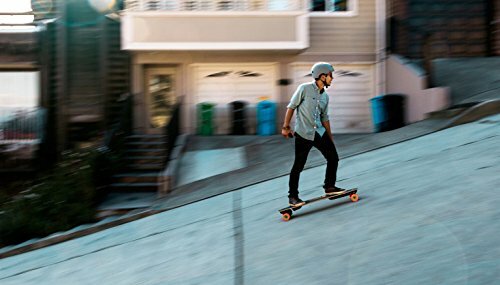 Since then, the electric skateboard has grown up with an appeal that goes well beyond the tight-knit groups of the Californian skate scene. Small, high-torque electric engines combined with smaller high-powered batteries are ushering in a golden age in ridable transport and Boosted are one of the biggest names in the game. 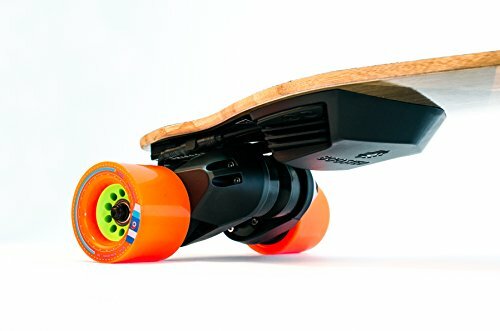 Their latest product, the second generation Boosted board, is way cooler and way more fun than anything else on the market right now. Viewed on flat tarmac this board looks beautiful. The slinky deck arches over a pair of bright orange, Orangatang wheels. 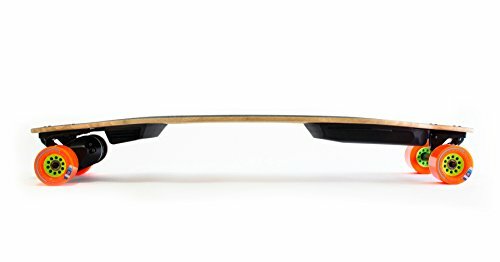 It’s made from bamboo which acts as a kind of suspension when you’re on the road- it’s so flexible that you can almost use this board as a trampoline. The motor and battery unit are tucked away neatly near the trucks where they’re less likely to get damaged by rogue rocks or loose tarmac. 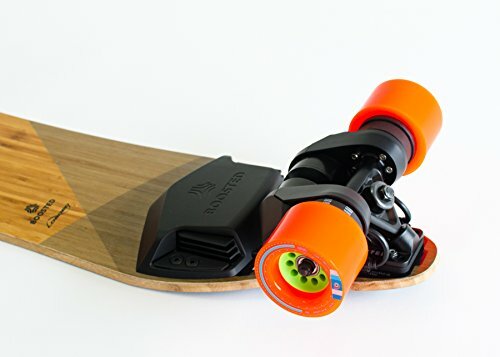 Purely from a design perspective, the 2nd generation Boosted board ticks all the right boxes. This board is priced at the top end of the market so it’s nice to see a bit of choice on offer. Users have the option of the standard battery pack, which has a 7 mile range or the extended battery which runs for a full 12 miles. The control hand-set offers 4 different riding modes for different types of surface, incline, journey and rider ability. 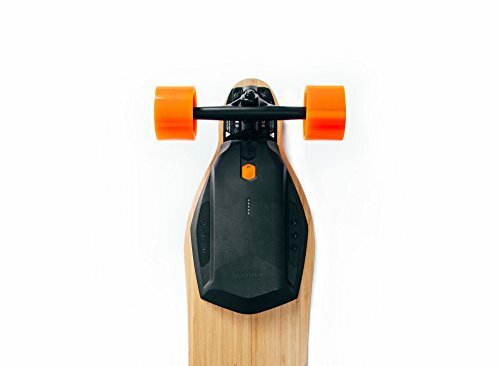 Furthermore, you can also push this like a regular skateboard, although there is a bit of resistance during manual riding. When we see a brand talking about high-performance we like to see it backed up on the spec sheet. This board has an unprecedented 2000W of output courtesy of its dual motors. That turns out a top speed of 22 mph on flat roads. What’s more impressive is the way that power is provided to the wheels via a belt drive system which allows you to climb hills of up to 25 degrees. Belt drives offer the best torque with the highest efficiency, although they do tend to wear down a little quicker. The amount of power that this board puts down is impressive. The only downside to that is the relatively short battery life compared to similar priced products. Even with the extended battery the distance isn’t great, plus this is a heavy piece of equipment so it carrying around is a bit of a chore. Boosted have tried to get around these issues of distance per charge through technology and plain smarts. The belt drive system is fitted with regenerative braking. That means when you brake the kinetic energy is transformed into usable power, recharging the batteries. They’ve also incorporated a quick replace system for the batteries so you can swap them out mid-journey, although extended batteries start at $200 each. 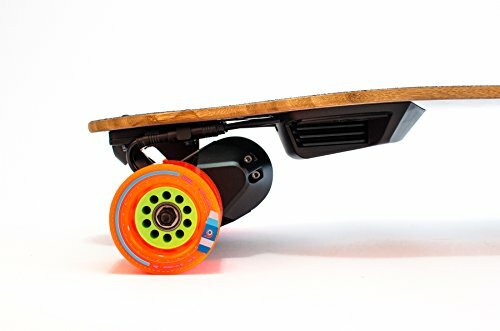 The Booster electric skateboard is among the most advanced products on the market which is reflected in the price. These are upmarket products that represent investments not short-term purchases. What I do like is that Booster offer replacement parts through their website. Here, you can replace wheels, bearings and chargers as well as the belt drive. For me, that protects your investment because it means one bad apple won’t spoil the bunch. If you’re looking for a serious piece of transport equipment that’s a blast to ride this is your product. The design. From the springy bamboo deck all the way to the clever belt drive torque system this product is well-thought out. Performance wise you’d be hard pushed to find anything better, particularly when it comes to tackling hills and inclines. The opportunity to purchase replacement parts through the manufacturer’s website will really help to preserve the longevity of this equipment. Lots of choice with replaceable battery packs and rider modes to help you get settled in to long-board commuting. The big one has to be the battery life which is a casualty of the high-performance. 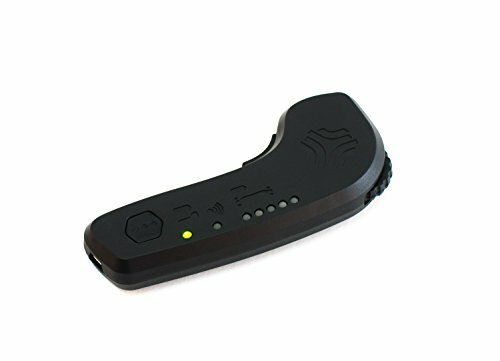 Replacement batteries will be a must if you intend on using this beyond recreation. Some difficulty in manual pushing. 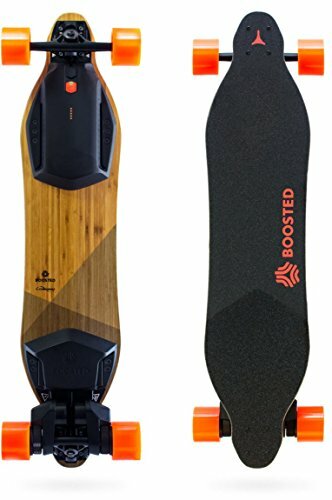 Very well designed with an impressive performance, the Boosted electric is one of the finest boards on the market. The battery life leaves a little bit to be desired, but aside from that I can’t find anything wrong with this product. The bamboo deck is comfortable over long-distances, climbing hills is a breeze whilst the top-speed is so fast you won’t even want to get there. 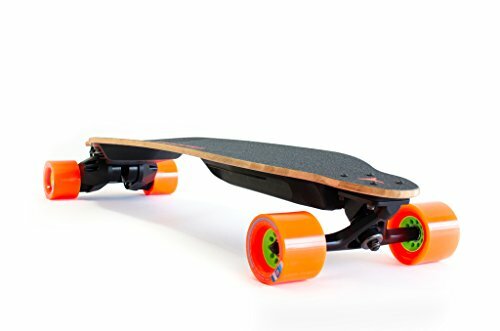 A benchmark product for the electric skateboard industry.